Four movies, $4 each, five days of rental – at a total of $16. That’s about the same as one would pay for one admission and a popcorn combo at a movie theatre. 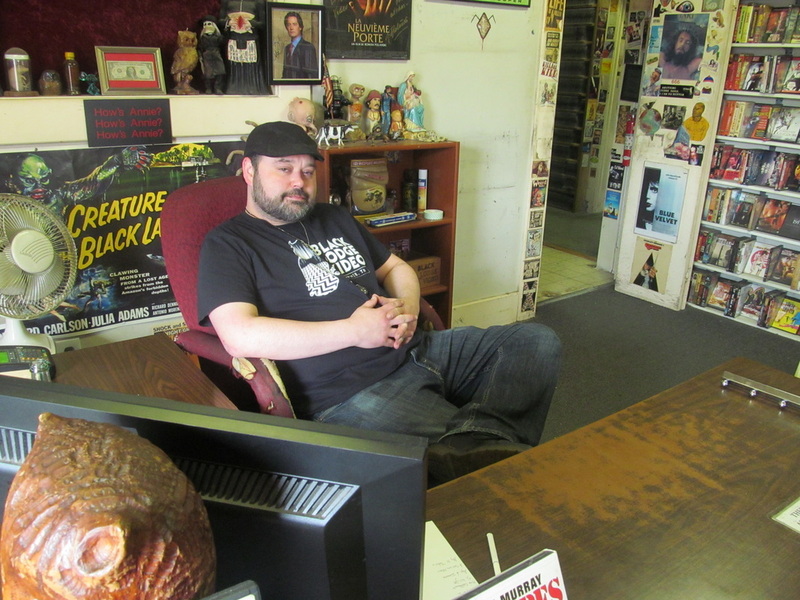 Black Lodge Video owner Matthew Martin doesn’t mind cutting his customers this deal and continuing to offer video rentals. Most video rental stores have closed, facing competition from Netflix, but Black Lodge Video at 831 S. Cooper St. remains a staple of the community. Open seven days a week from noon to midnight, Martin said he has approximately 30,000 individual titles in varying genres at Black Lodge. Martin said renting movies is a good idea not only for the cost but because 75 percent of films that people see, they may not want to see again. “And, truth be told, people don’t feel the need to own the physical copy anymore, just like music,” he said. Between all of Martin’s loyal customers, some of which have been renting movies from him since he opened in 14 years ago, about 100 movies are rented each day from Black Lodge. Before Netflix came along, Martin was renting about 500 movies a day. Since the rising popularity of the online service, he has seen a 25 to 30 percent drop in rentals. Netflix costs about $8 a month for access to the online library and $15.98 per month for the online library and DVD rentals. But, Martin said he has more options than Netflix as far as movies. Ian Quinn, a customer since Black Lodge opened, said renting from Black Lodge is more affordable than having a cable bill every month. Quinn, a fan of horror and comedy, said besides movies, he doesn’t watch TV anyway. Lynn and Brenda Westfall, customers for seven years, said they became interested in Black Lodge after their daughter rented a movie from the place one night. “Once we started we couldn’t stop,” Brenda said. Lynn said the selection is great and much less expensive than Blockbuster used to be when it was still in business. Self-proclaimed to have one of the top 10 sized collections of movies in the country, Martin is working on a website for Black Lodge. Currently people can find more information about the business on Facebook and Instagram. Martin has also hosted shows from live bands since 2004, most of which are free. Other times there may be a $5 cover charge, all of which goes towards the bands. Though there have mostly been local bands, touring bands such as Dead Soldiers, Jack Oblivion and Switch Blade Kid have all stopped by the lodge. Martin said he wants his business to be known for hosting all different types of genres of music-not just Folk and Rock n Roll. The next performance is Saturday, March 22, for a show featuring bands Pez, No Comply, Tree Burner and Hosoi Bros at Black Lodge. The show starts at 10 p.m. and there is a $5 cover charge.